First, let me say that I know I have been woefully short on the freebies I used to have. I am still trying to get organized with my shop at Scrappy Bee, the behind-the-scenes we do to keep the goodies flowing there, the social media quagmire posts it takes to get it all out there, and still try to create kits either for my store or freebies for the blog trains! Phew! That’s also with having a full time job! I’m hoping that after the beginning of the year, I can have a system going. If not, I think I’ve mentioned before that I now know what “creative teams” are for! One of these days I may actually put out a CT Call for help. 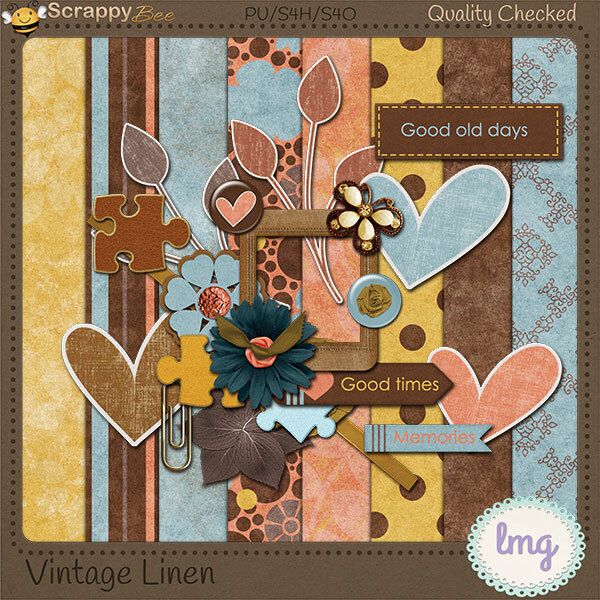 I have a new kit release in my Scrappy Bee Shoppe, Vintage Linen. It is a mini kit and I also created an alpha kit that coordinates with it. So, I started hearing about a DSD day coming up and I, not being a scrapper, had to ask one of the other designers what it was! I know there will be sales galore everywhere and Scrappy Bee will be no different! Designers will be having sales as well as there will be collabs on sale, too. I’ll have selected kits on sale for just $2.00 for the DSD sale, but the rest of my shoppe will be 50% off everything else. AND … with any purchase from either my shoppe, Lavender Mint Graphics OR Pink Papers Peppermints, you’ll get a free kit we collaborated on in celebration of our stores openings! PPP officially opens Saturday, Nov. 7 although she has a few things in there already. I hope you’ll stop by and visit my shoppe! Sale good from Nov. 6 – Nov. 9!